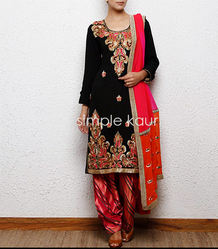 Black Silk Shirt With Heavy Multicolored Embroidery With Multishaded Salwar And Double Shaded Dupatta. Beautiful Party wear Suits encrafted with rich stones for every occasion and for women of all age. Crafted with intricacy, these suits come with a churidar or palazzos, in a plethora of colors and can be customised according to your color, size and needs.